For today's edition of Speak Up on Kotaku, we continue the discussion of future consoles with commenter Leaufai, who advises Microsoft to embrace their PC roots and give us a console that truly takes console gaming to the next level. Things have changed since the last generation of consoles were launched. PC gaming has changed. Piracy still makes it looker like a lesser platform to developers, but access to broadband has kickstarted a whole digital distribution thing that has made the platform much more profitable as well. Services like Steam show that PC gaming is still very much alive and worthwhile. Console ports are getting better as a result, as developers want to tap into this vast PC audience. As the consoles get older, many developers also head to the PC to show what they can do with the extra processing power it offers. Microsoft has a big stake in this. The company is synonymous with PC gaming, due to Windows being the main operating system (90% in 2011) for PCs. I think Microsoft should take advantage of this position and use the PC to strengthen their next-gen console experience and vice versa. This could give them the advantage in the upcoming console war, that they so desperately crave. 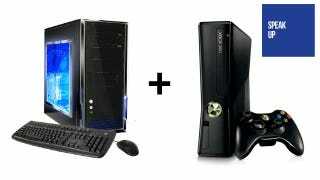 First off, they need to design the Xbox 720 in such a way that porting its games to PC is easier. If the porting process is smoother, the PC ports work a lot better. A good port is the best anti-piracy measure there is. Second, they need to integrate their services better. Game for Windows Live is an absolute turd, while they have a much better service running on their Xbox. Offering a uniform service across both platforms (and generally getting rid of bad software like GfWL) makes crossing over from one platform to the other one a better experience. The third is a combination of the two. There's a lot of money to be made in the indie gaming scene and Microsoft isn't doing enough to respond to that. Due to mismanagement Xbox Live Arcade isn't the home of indie games it could be and on PC every indie goes to Steam instead of Microsoft's stuff. By making porting from Xbox to PC easier and having a decent content delivery system that doesn't put the indie games out of sight (I'm looking at you Xbox Live) both Microsoft and independent developers could make a profit. Some of this stuff Microsoft is already doing. Xbox Live is becoming a cross-platform thing with the Live Anywhere program for example. But they can do more to integrate Xbox and PC gaming and doing more could help them in the long run.